Simple, compact, and low cost Ideal for optical connector production lines! Covers all typical connectors such as SC?FC?LC?MU, etc. Also, because it was designed with the needs of production line work in mind, there is absolutely no need for any complicated setup and measurements can be done with easy operation. 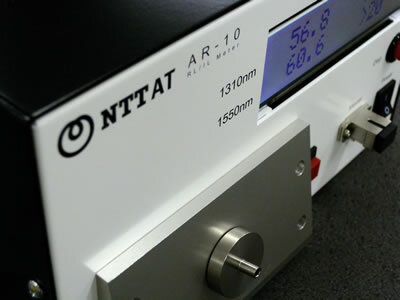 A universal switch which can transmit measurement data to a PC with one action is included as a standard feature. 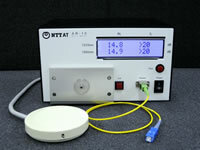 Can be used as a hand-push switch or a foot switch to match the production process. 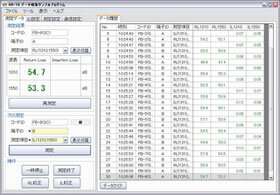 In combination with the sample software provided, inspection records can be saved efficiently. Moreover, using a communication port, data acquisition, operation, etc. can be done by remote control, and the customer is also able to create custom software. *3: With a room temperature of 25°C, using a master cord of the same type as the connector and measuring within 1 min. after calibration. As this device is a measuring instrument using an optical branching coupler, it does not have spatial resolution. Therefore, in addition to the connection point of the master cord, measurements include the reflection in the subsequent optical transmission path, as well as reflection in the terminal part, etc.